Click here to view our complete agenda. Please note that the agenda is subject to change. "Kentucky's growth in Aerospace Exports to $10.85 billion in 2016 proves the potential for the continued growth of this industry and its capability to become the dominant economic driver for our Commonwealth." 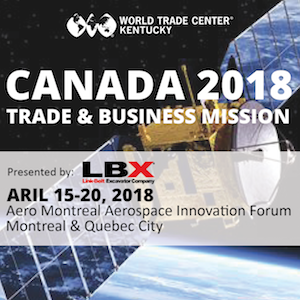 "WTC-KY Trade Missions have helped us specifically in educating ourselves about foreign markets and cultivating working relationships with foreign business partners and also more generally in reminding us that we work in a truly global economy and that greater success lies in an ability to participate fully in that economy." "Trade & Business missions play an important role in the toolbox of any company or organization already involved or planning to deal with international business." "In Mexico I was able to connect two of my contacts. They are now working with each other, and I am building a relationship with both of them. That made me more valuable to them because I was a connecting link." Click here to view our sponsorship opportunities. Cost does not include flights to and from Canada. Pricing is based on single occupancy.